The 2019 Family Car of the Year! 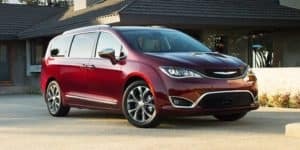 The 2019 Chrysler Pacifica! With the most advanced entertainment system in its class, your children will forever have fun on the road. Need more cargo space? Simply fold down your second or third-row seats to make more storage space. Don’t leave anything behind with this minivan. Visit Wabash Valley Chrysler to receive an amazing price on the 2019 Chrysler Pacifica! Serving Peru, Indiana.